For now, here are some things in the World of Hand Embroidery that have caught my eye lately and I thought worth sharing. Kick back, pour a cup of your favorite morning brew, and let’s slog through this journey together, shall we? 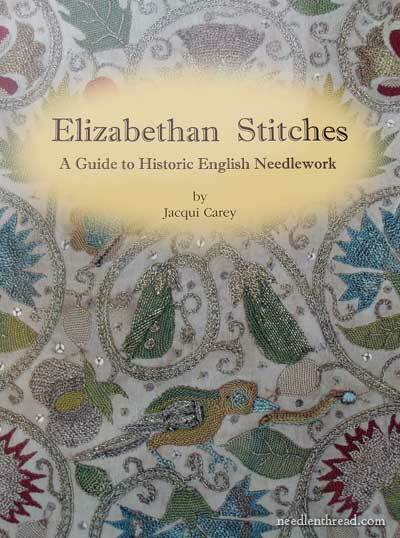 And, speaking of historical needlework and castles and whatnot, did you know that Jacqui Carey’s book Elizabethan Stitches is now available in the US? If you aren’t familiar with the book, but you are twitterpated by historical embroidery, you can read my review of Elizabethan Stitches here. 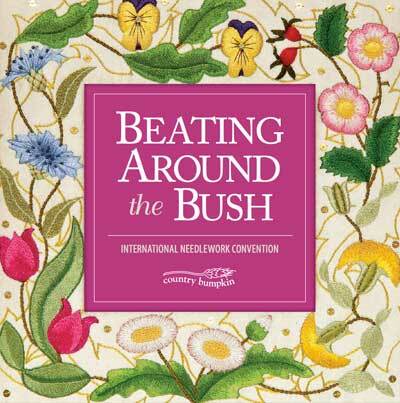 Country Bumpkin’s Beating Around the Bush is right around the corner. I’d love to be going, but alas, I’m not. Even if you’re not going, you can still take part in their Village Fair on Wednesday, April 18th. You’ll find designers, needlework supply venders and so forth their selling their wares and introducing you to new techniques, to hand embroidery products, kits, books, and whatnot! So if you live in the Adelaide area or are traveling in Australia in the next couple weeks, you might slot that into your schedule! The French Needle has some new surface embroidery kits out that are really darling! They’re these little gals, doing different things: there’s a ballerina, a city girl, a bicycler, a seamstress, and a shepherdess. The kits come with printed cotton, floss, needle, and instructions. Each figure is about 4.5″ high. The whole set would be fun to collect and stitch and frame. I haven’t seen the kits myself, but I really like the look of them finished, as collected in the photo above. They look fun! 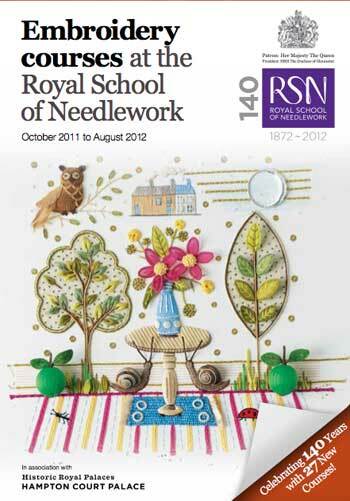 Have you seen the Royal School of Needlework’s flyer for day classes? For those of you who get out and about on the travel scene in the summer, maybe you should look up a day class at the RSN? Even if it’s not quite in your budget to vacation abroad, you can do what I do – look at the flyer and dream! 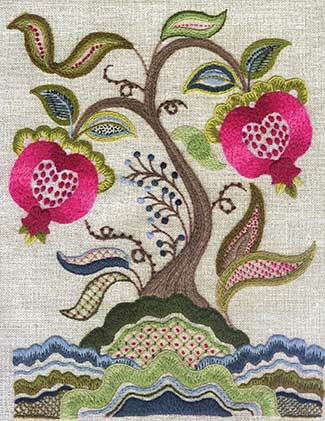 I love seeing what’s on offer, and just looking at the beautiful close up images of some gorgeous embroidery. But if you live in some proximity to the RSN or England – or if you are traveling abroad – it could end up being the icing on your holiday cake! If crewel embroidery is your thing, Talliaferro Designs has released a couple more kits, which you can find at Wooly Thread, including this Tree of Life kit. If you don’t know it, I’m a pomegranate fanatic – I like the fruit itself, but I love it as an element in embroidery better! So this caught my eye right off the bat! Talliaferro designs are stitched with Appleton wool. The design kits come with the design and complete instructions, and Wooly Thread sells separate Appleton wool packs to go with the various kits. I’m enjoying Janet Granger’s blog a lot lately. 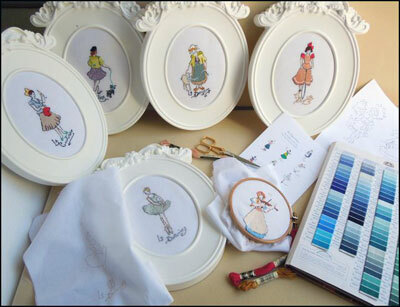 She is the Janet Granger of miniature needlework fame – she designs and sells dollhouse embroidery kits. (Incidentally, she has a really nice list of miniature embroidery tutorials on her website, if you are into tintsy-wintsy needlework!) 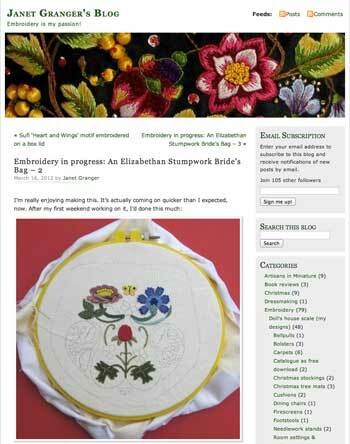 On her blog, Janet is working through An Elizabethan Stumpwork Bride’s Bag. It’s been interesting following this project as it develops. If you like 17th century embroidery or stumpwork, you’ll love watching her work out some of the techniques! 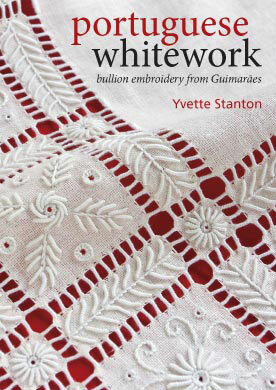 There aren’t a lot of books on my wish list for this year, but Yvette Stanton’s upcoming book, Portuguese Whitework is definitely one of them. If you haven’t seen her video preview of Portuguese Whitework yet, you might want to take a look at it! it’s lovely! And the whitework? It’s exquisite! Remember the piece of whitework embroidery I wrote about the other day? It is heavily covered with bullion embroidery, too – though not of the Portuguese Guimarães style – and it can give you a little idea of what this type of embroidery is like. Yvette’s taking pre-orders for the book now, and it should be available by the end of this month (fingers crossed!). Wow – I had some other tidbits for you, but I think I’ve outworn my welcome! Hope you enjoyed the journey, though, and that something here struck your fancy! Now, I’ve got to get back to stitching! I just love your website! I love hand work and only wish there were classes around me to take. I do plan to start doing my own version with your tutorials. I will make them into a stitch book of some kind. Any advice as to where to start? 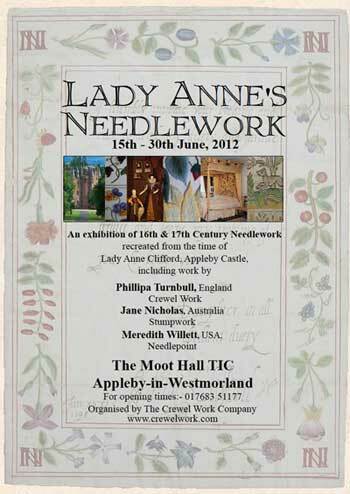 I’m one of the lucky ones who’ll be taking Lady Anne’s Needlework Retreat and Tour, followed by the OIDFA Lace Congress in Caen, France. http://www.oidfacaen.com/accueil-en.html I can hardly wait until June. Hey, me too. See you in Appleby! Your site is bad for my stash and craft book addictions. I bought both Crewel Twists and Elizabethan Stitches based on your reviews. I am awaiting Elizabethan Stitches with a lot of excitement. Seems that Portuguese Whitework is going on my list as well. Amazon says that it will be released this month. So much embroidery, so little time. RSN Courses are taught in the US, out of San Francisco. Day Courses are being taught in May and Sept of 2012. May courses are listed on the RSN website. These are courses conducted by actual RSN Tutors, who were trained at the RSN. Lucy Barter is the US Coordinator at lucy@forever-emb.com She also has the RSN books for sale too! So wake up from Mary’s dream and just travel to S.F.! Or Tokyo, or Glasgow, or to the Netherlands where they are also doing RSN classes. outworn your welcome? Never! Thanks for drawing my attention (and for the oveseas fun, my imagination!) Have a blessed Resurrection Day tomorrow!! I appreciate all the links and updates! You could never wear out your welcome Mary, especially talking about books. We are both bibliophiles and we have the library to prove it. I have bought several books recommended by you, including Hazel Blomkamp’s and Elizabethan Stitches. Sadly I will never get to the workshops and exhibtions you talk about but I do love to hear about them, so keep it all coming. Hello! You have very beautiful work! And the colors, and a very neat job. Thank you. I’m also fond of embroidery. Only in Russia such work is not appreciated, unfortunately. Only a woman embroidering.